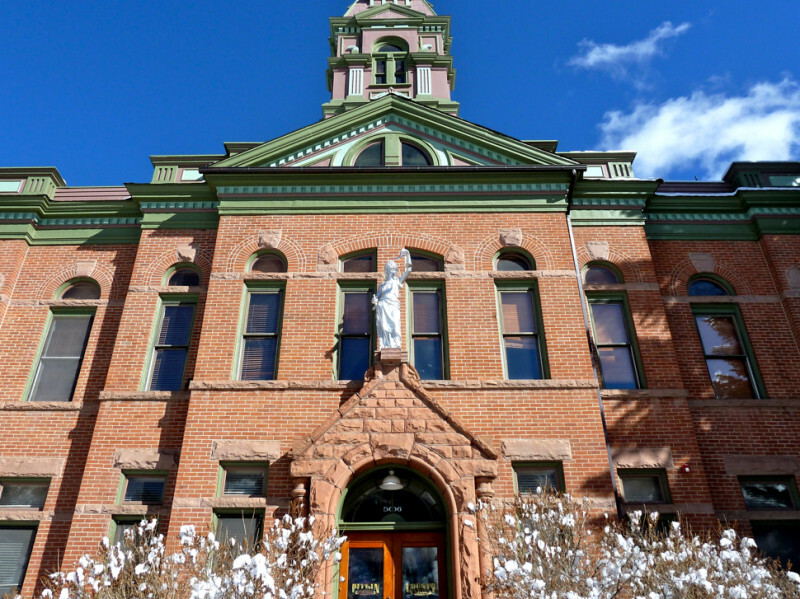 The Pitkin County Courthouse in Aspen. All ballots for the November 2014 election have been sent to local voters. ASPEN – Registered voters in Pitkin County already should have their ballots in hand for the Nov. 4 general election. While up to 75 percent of the counties in Colorado exercised mail-in ballot distribution during prior elections, this is the first general election that Pitkin County has offered the option, said Vos Caudill at a Snowmass Village Town Council meeting on Monday. That’s a result of statewide legislation that was passed last year, she said. But it would be wrong to think the mail-in ballot option is the only choice for voters in 2014. Early voting started Oct. 20, and is available Monday through Friday during the next two weeks. Stop in to the clerk and recorder’s office at 530 E. Main Street (next to Pitkin County Courthouse) between 8:30 a.m. and 4:30 p.m. to vote in person. Voters also may visit the clerk and recorder’s office to cast their vote on Saturday, Oct. 25, and Saturday, Nov. 2, between 10 a.m. and 2 p.m.
Those who haven’t received their ballots may go to pitkinvotes.org, the statewide voter registration system, to check its status. If the address is wrong, the initial ballot will be voided and a replacement will be sent in the mail. “You tell us where to send your ballot,” Vos Caudill said. She asks that citizens check that website before contacting her office at (970) 920-5180. They are located at the clerk and recorder’s office in Aspen, Snowmass Village Town Hall and Grace Church in Emma. Voting is allowed from 7 a.m. until 7 p.m. that day but presentation of standard identification (driver’s license or passport) is required. The service centers also are where people may drop off their mail-in ballots, rather than sending them in. A fourth service center, in Redstone, allows for ballot drop-offs but does not allow same day voter registration. Voters who live in Snowmass Village will see an Aspen Ambulance District question on their ballot but their votes on this issue won’t count and won’t be released, Vos Caudill said. That was a result of a misprint on the ballot. On election night, unofficial results will be posted on the pitkinvotes.org website at 8 p.m., 9 p.m. and at the end of the election. Nov. 21 is the final date that results from this election can be certified, or deemed official. Aspen Journalism and the Aspen Daily News are collaborating on coverage of local government. The Daily News published this story on Tuesday, Oct. 21, 2014. Follow reporter Madeleine Osberger on Twitter, @Madski99.